Japan is the second largest luxury market in the world – behind the United States and ahead of mainland China – with 3.6 trillion yen (about $33 billion) spent each year in luxury goods. The luxury industry encompasses various sorts of goods such as drinks, fashion, cosmetics, fragrances, watches, jewelry, luggage, and handbags. In the past few years, this market experienced a steady climb in Japan. This upward trend in Japan’s luxury marketing has opened a world of opportunities and possibilities for companies in the industry. To tap into these opportunities, businesses employ different marketing strategies. Among these strategies, the latest and most advanced is digital marketing. Luxury labels are built on exclusivity, which used to mean that having an online presence was not necessary within the circle of existing shoppers. However, now that most of their customers are online, it’s imperative for luxury brands to dive into the web along with their shoppers. This is why it’s essential for luxury brands to use digital marketing. Digital marketing involves using digital channels such as search engines, social media, email, websites and mobile apps to connect with existing and potential customers and is often used by companies for leverage in the market. 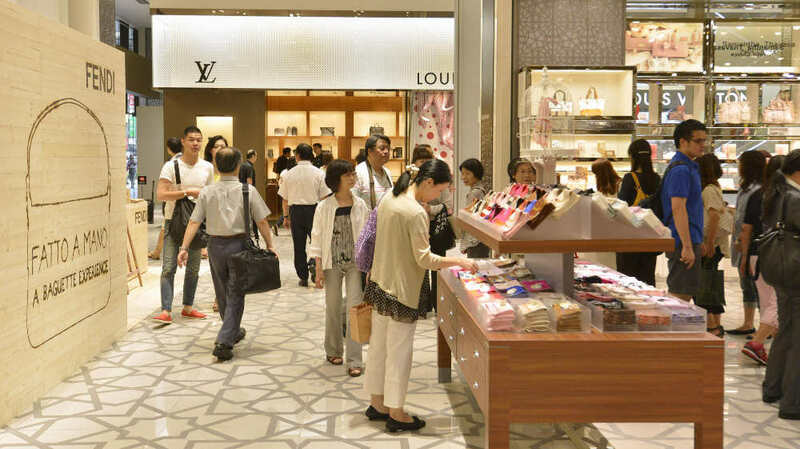 Japan’s luxury goods industry steadily rose again a few years after it had a major downturn. With the global financial crisis in 2011, followed by the disasters in Tōhoku and Fukushima, luxury spending in Japan shrank by over 1 trillion yen ($10.6 billion) in 2012. Today, Japan’s luxury shopping scene has changed. As mentioned earlier, Japanese shoppers are now spending 3.6 trillion yen (about $33 billion) annually on luxury goods. In a report by McKinsey & Company, the Japanese luxury market is expected to maintain its positive growth: 82% of luxury executives surveyed responded that their sales outlook for 2017 is significantly better than 2016. By 2020, it is also anticipated that the market will grow by a moderate rate of 3% to 4% per year. This is confirmed by local executives of luxury brands, with 86% of them being optimistic or somewhat optimistic about the development of the Japanese luxury market in the next 3 to 4 years. 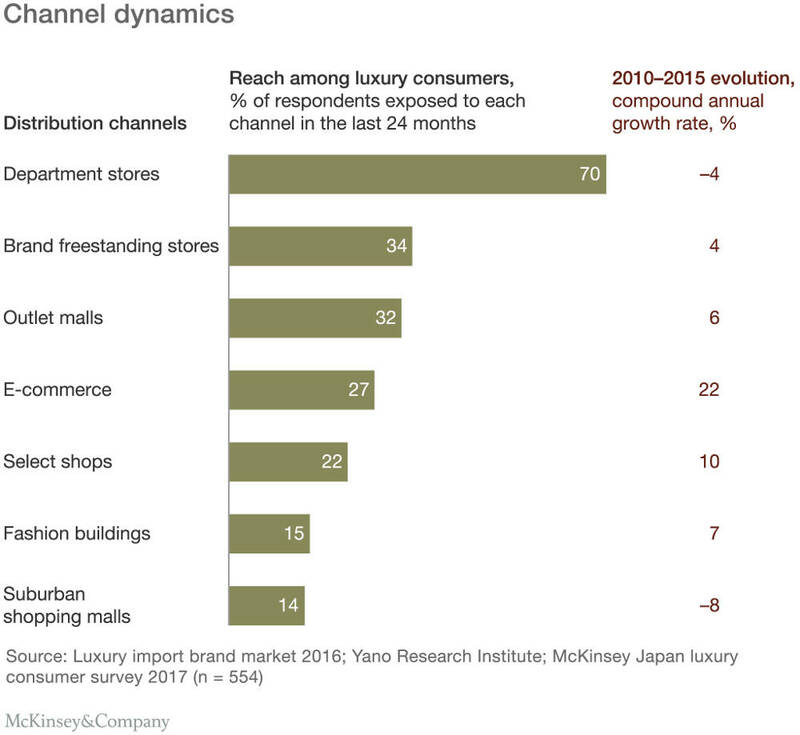 In addition, Japan accounts for up to 30% to 40% of the profitability of some global luxury brands. This growth has also been affirmed by a more recent research conducted by McKinsey & company with over 500 Japanese luxury consumers from March to April 2017. 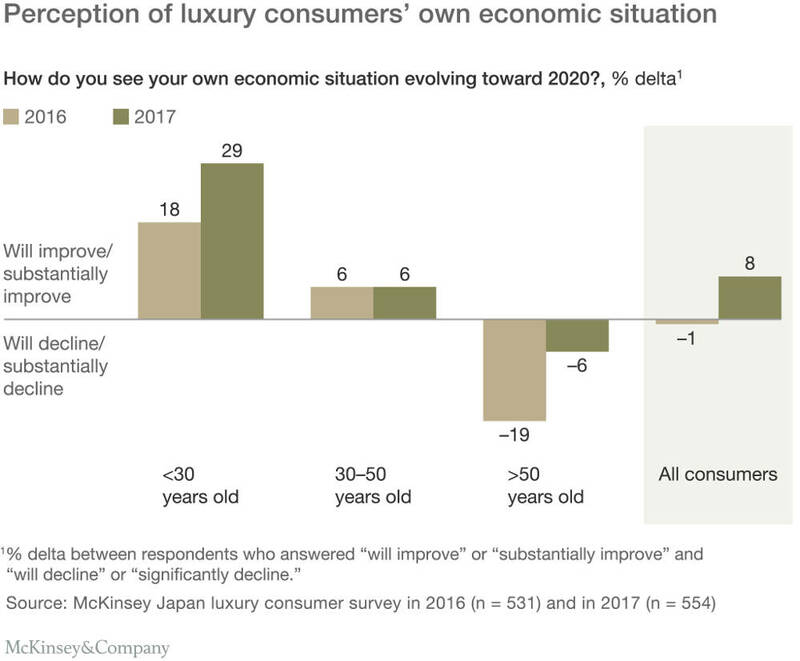 The results show that Japanese luxury consumers’ perspective on their own economic situation improved by nine points versus last year, with millennials (consumers younger than 30 years old) being the most optimistic. Japanese department stores are still the main venue of purchase for Japanese luxury consumers, representing over half of the luxury market value. However, they have been struggling for the past decade, undergoing a 4% annual decline in sales between 2010 and 2016. Research also shows that 70% still buy luxury products in a department store. The competition for department stores includes brands’ free-standing stores, duty-free stores, outlets, and online stores, where people can also opt to purchase luxury goods from. The luxury industry’s upward climb is likely to be driven by the increased role of the millennial generation. Millennials are observed to be more enthusiastic about luxury spending and less reluctant to show off than the other age groups. The younger generation is buying brands like Céline, Balenciaga, and Gucci, which are sought-after all over the world. Inbound travelers are also contributing to this growth due to the favorable weak yen and higher prices for luxury goods in other countries. Luxury spending by Chinese tourists is estimated to account for 7% to 10% of the Japanese luxury market. Tourists are expected to further boost the market in anticipation of the 2020 Tokyo Olympics. With the recent growth of the Japan luxury market, there has been a renewed interest in Japan in the past year or so. Japan actually accounts for 11% of global luxury spending and has remained a major profit driver for many established luxury players. Thus, it is critical for relatively unknown brands, and even for established ones, to stand out among the numerous luxury labels. Digital marketing is one of the possible strategies to be visible and reach existing and potential customers. 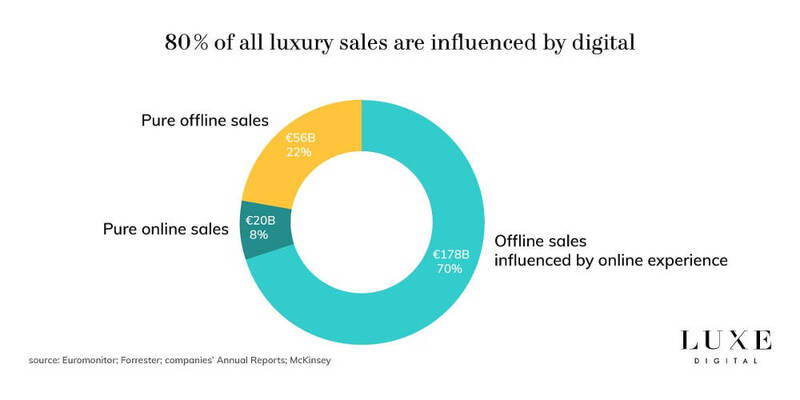 As a matter of fact, Luxe Digital recently published a report suggesting that digital influences at least 80% of all luxury sales. It’s understandable why luxury companies are cautious to go digital. However, with decreasing returns from print and display advertising, and luxury shoppers spending more time online, luxury brands don’t merely need to adapt to survive but to thrive in the digital world as well. Here are several digital marketing techniques that are currently trending in the luxury industry. Storytelling is vital in every digital marketing campaign. Being able to tell the story behind the brand, and explaining the values that define it, is essential to effective luxury marketing. It would be easier for a brand to generate an advocacy online by communicating that their brand represents an assurance of luxury, quality, performance, style, or whatever value they stand by. Luxury goods have always been at least as much about image, style, and intangibles than about the actual quality of the product. Aside from sharing the brand’s narrative, it is also effective to create contents that are aspirational and appeal to the customer’s desire to display their status. Since one of the main reasons for purchasing luxury goods is to showcase status, brands can take advantage of this by creating and publishing content that, when others share, will make them look stylish, smart, or cool to their friends. After all, a luxury brand gives their customers an opportunity to showcase a lifestyle and a value system. There have been several successful digital marketing campaigns that involved great content. Burberry is an excellent example, with its social media campaigns and creative videos that combine history, fashion, and the appeal of a glamorous lifestyle. To date, the brand’s channel has over 317,000 subscribers (in addition to 99 million viewers) on its YouTube channel. In 2015, the brand produced a holiday campaign tribute for the movie Billy Elliot, featuring notable British celebrities reveling while wearing the classic coat-and-scarf attire. This was a marketing win for the brand by retaining a “distinctly British” attitude, yet still exuding a fun vibe in their message. The ad received 12 million views within a month. Whether selling fashion, cars, travel experiences, or luxury properties, stories capture the audiences’ imaginations and make them want to enter a brand’s story. Visual social networks like Pinterest provide a huge opportunity for luxury brands to raise brand awareness and advocacy, since photographs are one of the best media for marketing luxury products. Images evoke the aspirational emotions that can be connected with driving a luxury vehicle, wearing designer clothing, or being a part of something exclusive. In fact, Chanel is one of the most ‘pinned’ brands on the social network, with over 1,244 pins of Chanel products pinned on the social network per day on average. 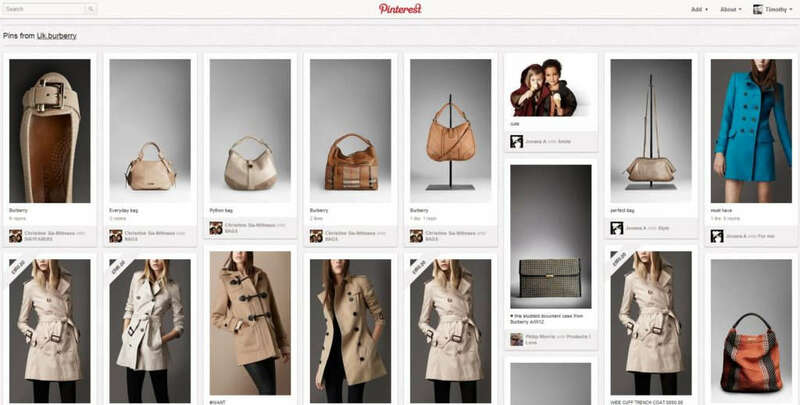 Burberry has actually partnered up with Pinterest, the biggest beauty platform in the world, in providing a personalized experience in the social media site. They are the first luxury brand to do so! Other than Pinterest, Instagram and Twitter are also effective channels for luxury brands to showcase the prosperous lifestyle and designer tastes of their target market. The power of advertising through Facebook should also not be underestimated. Due to the high level of segmentation and targeting that it permits, Facebook Ads are one of the most effective forms of online advertising. A well-executed SEO strategy is one of the most lucrative digital marketing investments that a luxury company can do. Google is one of the most significant channels for luxury shoppers to find products, discover more about brands, and make their purchase. In the past, luxury brands relied mainly on brand awareness to drive sales. This has changed recently since a large proportion of luxury brands have begun investing in SEO strategies. SEO is beginning to be recognized as a legitimate source of revenue with the growth of the digital industry. Some jewelry brands, specifically Tiffany, have bought into SEO and now have firm, successful strategies which have led to them dominating the search results. 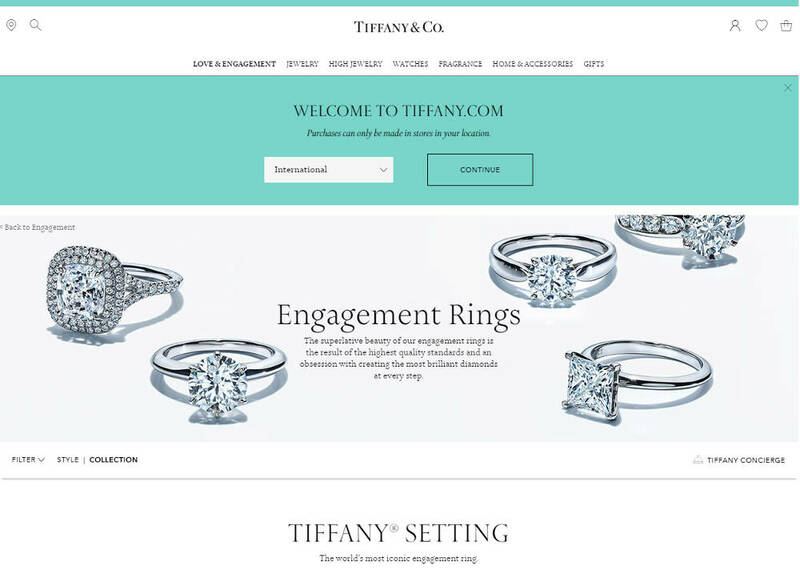 As a matter of fact, Tiffany was one of the first luxury brands who took online marketing and online sales seriously, and this strategy has apparently paid off. 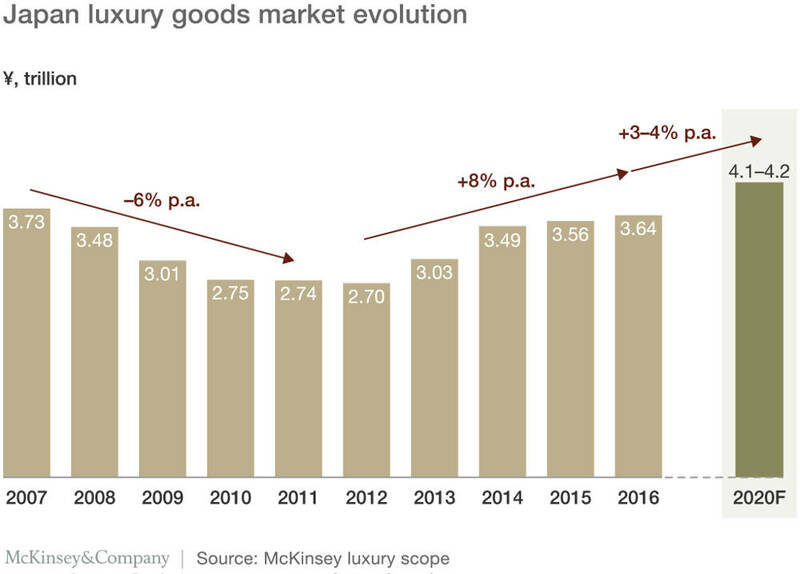 Luxury companies are reaching a critical point where they must either adapt or risk losing ground to a growing number of competitors. Nonetheless, there are still a lot of other factors that determine the success of luxury brands in the digital world. In a nutshell, the upward climb of Japan’s luxury industry has opened a world of possibilities and created numerous opportunities for luxury brands. In order to stand out amid competition as well as reach out to the target market, it is essential for luxury companies to employ digital marketing strategies. More and more consumers in the luxury goods market are going digital, thus luxury brands must adapt as well. Several digital marketing strategies have been proven to be effective in the luxury goods industry; this includes content creation, social media marketing, and SEO optimization. Info Cubic Japan has many digital marketing solutions for tapping into the opportunities in Japan’s growing luxury goods industry. Contact us today to get into Japan’s market with success.